I love notebooks and blank books. I love scribbling, pasting pictures inside, recording Tarot spreads, and drawing designs for gardens. I guess you could call these my grimoires, though I do more journaling with them than anything else. I would be mortified if I got hit by a bus and someone else were to read them. They're disorganized, battered, and generally a mess. How about you? Is your Book of Shadows well-organized? I have one friend who makes an index for hers! Thanks for stopping by Belle, Book and Bramble. 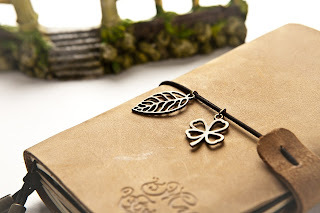 Belle, Book and Bramble is dedicated to the small workings of magic in everyday life. 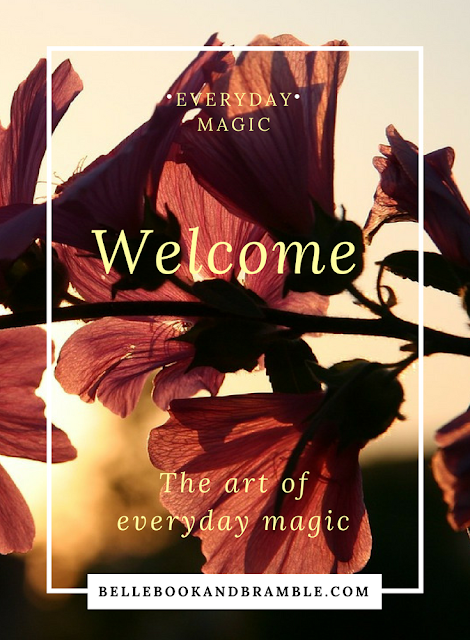 Magic is all around us – in the flowers of the garden, in cooking delicious things, in a fresh stack of books - in all the beautiful things that we create as we move through our days. Belle, Book and Bramble intends to share some of the creativity of ordinary life, and reveal some of the magic within all of us. Magic isn’t just something practiced at full and new moons. It’s a lifestyle. It’s in handfuls of salt and colors of paint. It’s in the tomatoes I grow, in the perfume I wear, and the feather I found this morning. It’s all around us, waiting to be seen and experienced. I hope you enjoy coming to play with me, that you come and share your own magical, creative spark that lights up your world. Belle, Book and Bramble is is a participant in the Sage Goddess Affiliate Program, an affiliate advertising program designed to provide a means for sites to earn advertising fees by advertising and linking to sagegoddess.com. Belle, Book and Bramble will receive a referral commission if you purchase Sage Goddess products, services, or training recommended on this site. Suburban Hedgewitch making things and making magic. The information contained in this blog is for general information purposes only. The information is provided by bellebookandbramble.blogspot.com, and while we endeavor to keep the information up to date and correct, we make no representations or warranties of any kind, express or implied, about the completeness, accuracy, reliability, suitability or availability with respect to bellebookandbramble.blogspot.com or the information, products, services, or related graphics contained on bellebookandbramble.blogspot.com for any purpose. Any reliance you place on such information is therefore strictly at your own risk. In no event will we be liable for any loss or damage including without limitation, indirect or consequential loss or damage, or any loss or damage whatsoever arising from loss of data or profits arising out of, or in connection with, the use of bellebookandbramble.blogspot.com.